Flawless (...) excellent recording technique (...) impeccable technical precision (...) Eschenbach's recording of the Fifth undoubtedly numbers among the upper third (...) These Seasons can be regarded as a reference recording. There's a pleasant expansiveness to the sound and a solid foundation to the orchestral sonority. We get excellent depth and plenty of atmosphere. (...) In the second movement, we hear that the Philadelphia's strings remain one of its glories. A lyrical alternative to the earthy and pithy Russian tradition. His (piano) touch is magical, with a natural feel for the flexible phrasing that the music calls out for. The SACD sonics are so clear and wide-ranging and the ensemble balance is so natural that the orchestra occupies a space seemingly independent of any electronic equipment. (...) Eschenbach makes full use of his orchestra's legendary tonal richness and instrumental color-qualities tailor-made for Tchaikovsky's scoring. 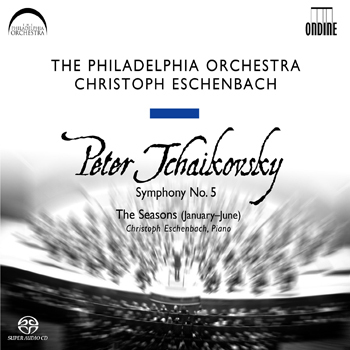 The legend lives on as never before... - Ondine's second recording in the acclaimed partnership with The Philadelphia Orchestra combines Tchaikovsky's famous Fifth Symphony with a special bonus, the first half of the piano cycle The Seasons. The latter is Christoph Eschenbach's first extensive solo piano recording in nearly thirty years. Before turning to conducting in the 1970s, Christoph Eschenbach had earned a distinguished reputation as the foremost pianist to emerge from post-war Germany, making his United States concert debut in 1969, with his mentor George Szell and the Cleveland Orchestra. The finest SACD recording technology highlights the unique spirit of a live performance of the legendary Orchestra, as well as of its world-renowned “Philadelphia Sound”.